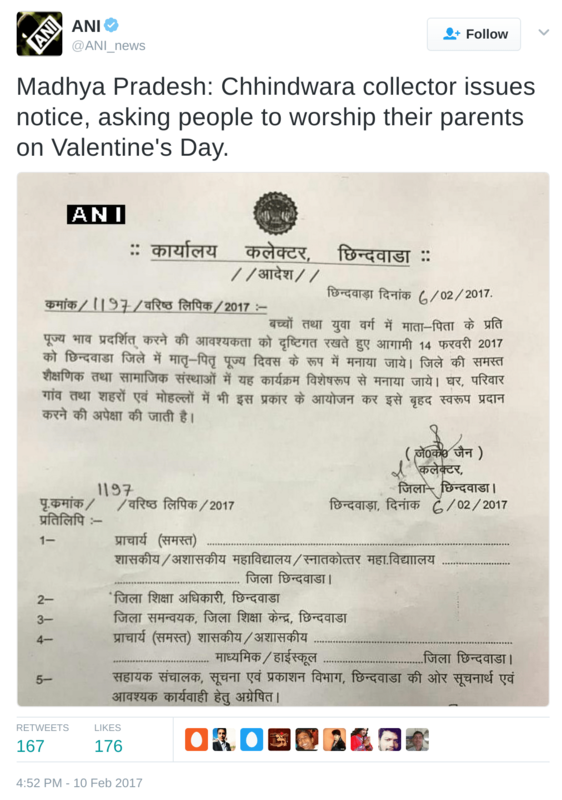 The Bajrang Dal attack on couples on Valentine’s day is nothing new. In fact, many senior leaders of BJP, VHP, Bajrang Dal and RSS have time and again voiced their opposition to Valentine’s day by terming it as ‘western culture’ which degrades ‘Indian culture’. In fact, as an antidote to this invasion of ‘western culture’, many right wing leaders have often suggested that Feb 14 be celebrated as ‘Matru-Pitru divas’ instead, a day when one worships their parents. This year, one collector in Chhindwara, Madhya Pradesh, issued a notice asking people to do so. However, this rather cute celebration at a BJP office, even if it is not Valentine’s day celebration as claimed and just a get-together, hopefully, will be an inspiration for the right wing to let go off the hooliganism in the name of Indian culture. Make love, not war.